Remember not too long ago when some internet dude was saying that the best way to deal with harassment on the internet was to basically create a DMCA for harassment, where people could issue takedowns? And remember how we pointed out that this would make things worse, because just as the DMCA is regularly abused to silence people, this new tool would actually be used as a tool to harass more people and silence their speech? Here's just a little example of why a DMCA-like approach is a really, really, really bad idea as a way to deal with harassment or abuse online. 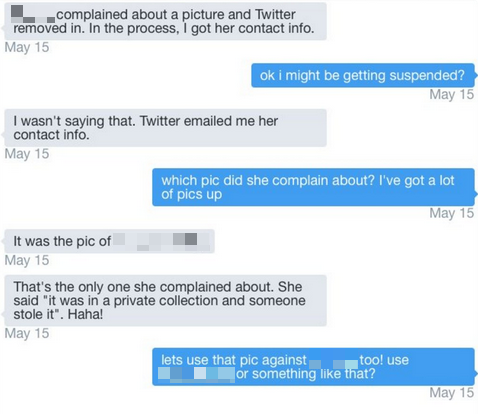 Business Insider has a story about an unfortunate setup where a woman who is clearly being harassed was told by Twitter that she should file a DMCA notice, since some of the harassment involved using some of her photos. Following the sending of the DMCA notice, Twitter forwarded her notice to the folks harassing her, making them somewhat gleeful since it included her full contact info. Elsewhere the same people discussed literally using the general controversy over the DMCA to create further harassment of the individual. The person complained to Twitter about the harassment and it appears that someone from Twitter told her that since the people harassing her were using photos, she should make a DMCA complaint. This was mistake number one. The DMCA should never be used for things that aren't really about copyright issues. It's not designed for that kind of thing and Twitter deserves to be chided for one of its employees suggesting that. However, in looking at the commentary around all of this, a lot of people are angry that DMCA notices involve passing on the full notices. I saw someone complain that companies should never forward on DMCA notices because it only will be used for abuse. That's a really bad idea. There are good policy reasons for why we should want companies to forward DMCA notices on to the person who gets their work taken down. For one, given all the bogus takedown notices we talk about, things would be a lot worse if the people who were accused of infringement never were able to find out the details of who sent the notice. That's part of the point of the DMCA, to create at least some channel of communication between the copyright holder and those accused of infringing. Obviously, in a harassment situation, things are totally different and it's why the DMCA notice-and-takedown is exactly the wrong tool for this sort of thing, and any attempt to expand it in that direction is a really, really bad idea. Furthermore, we should want DMCA notices passed on, including to places like Lumen Database, because that's how we actually get some information about how the DMCA notice and takedown process is working -- or not working. Worrying about censoring information in notices or not passing them along is not a good move. It just highlights why the DMCA process is a bad idea in contexts like harassment. Now, the Business Insider article does make a good point that other companies, like Automattic and Github, are much clearer to people who are submitting DMCA notices that their details will be passed on to those who they're accusing of infringement -- and point out that you can have an agent file on your behalf. That's also something that Twitter should do. But people complaining that Twitter should not forward on DMCA notices are confusing two separate issues. Twitter absolutely should forward on DMCA notices. That's important. What they shouldn't do is tell people to file DMCA notices over harassment issues.